Take a Motorbike Manufacturer, an MP, a Map Maker a Mayor, and a lot of motivation and what do you get – apart from alliteration? 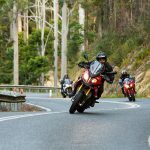 – You get an Australian first; a dedicated regional motor cycle map encompassing eight rides in the New England High Country. Parliament House in Sydney was the launch pad earlier this week for this project and The Hon. 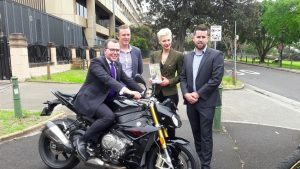 Adam Marshall, MP, Member for the Northern Tablelands launched the dedicated motorcycle touring map as part of a smart partnership between the six local Councils of New England High Country, Hema Maps and BMW Motorrad. The project has been on the drawing board for nearly three years. Providing something for everyone including a wide variety of riders, the map features the region’s top eight rides covering Thunderbolts Way, Waterfall Way, Old Glen Innes Road, Gwydir Highway, Oxley Highway, Tourist Drive 19, Bruxner Highway and Mount Mackenzie Drive. “This is a perfect way to showcase New England High Country”. “The Hema New England High Country motorcycle map we have produced is just one of a number of marketing initiatives we have developed in collaboration with the region to help drive the visitor economy. We are excited to see more amazing content being produced in the coming days as the touring group of riders head off to the region.” Said Hema maps CEO Rob Gallagher. To celebrate the launch of the New England High Country map, BMW Motorrad has chosen the region as the host of the 25th anniversary edition of the popular BMW Safari programme in 2019. The Safari will kick off in Windsor, New South Wales, before trekking through the New England High Country on what will be a memorable adventure. “This is an incredibly exciting partnership for us,” said BMW Motorrad National Marketing Manager, Nigel Harvey “Not only have we created an Australian-first with the New England High Country map and the Armidale Regional Council, but to be able to properly delve into the region with the 2019 BMW Safari is a wonderful opportunity for us and our customers”. The partners envision the region will benefit by an injection of more than $250,000 each year.